Simple and clean above counter rectangular white ceramic vessel. Premium white glaze for a glossy finish. High-quality ceramic cartridge. Kiln dried ceramic construction. Smooth non-porous surface prevents from discoloration and fading. This model is designed with integrated hot-cold supply lines for standard US plumbing connections. All mounting hardware and hot-cold waterlines are included. Double fired and glazed for durability and stain resistance. Sleek single lever handle for ease of operation and temperature control. Constructed with lead-free brass ensuring durability. Re-inspected prior to shipping your order. A solid, modern, wall-mount ceramic vessel with a large, integrated bowl for optimal basin volume, an overflow, and kiln dried ceramic construction. Double-fired to ensure long-lasting durability. It measures 20.5 in. across, 16 in. from back to front, and 6 in. from top to bottom, and comes predrilled to accommodate your 4 in. off-centre faucet. Coated in a premium white glaze for a stain-resistant glossy finish. 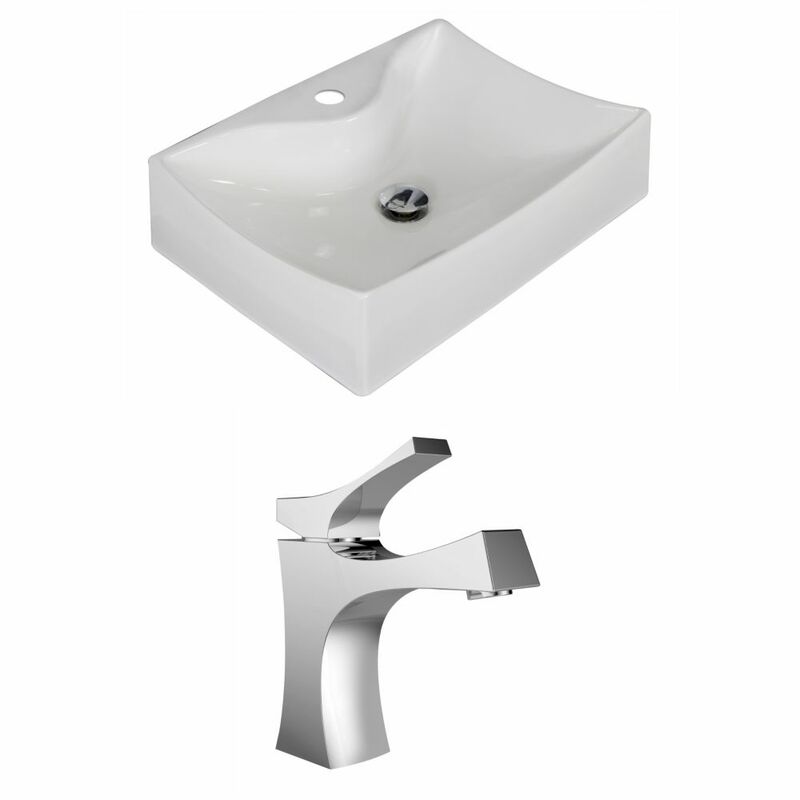 21 1/2-inch W x 16-inch D Rectangular Vessel Sink in White with Faucet It features a rectangle shape. This vessel set is designed to be installed as a above counter vessel set. It is constructed with ceramic. This vessel set comes with a enamel glaze finish in White color. It is designed for a single hole faucet.